Most music critics, like myself, tend to complain at frequent intervals about how bad is the music that gets to the top of the charts. That is usually true, since most people who buy records don't think or listen to music like the self-styled judges of artistic merit. But once in a while an artist comes along who makes music that pleases the pundits and actually sells well. We have a current example with Tori Amos, whose fascinating album Boys for Pele went to number two on the charts in its first week. But that's the kind of exception that is hard for even seasoned observers of the music business to explain. Usually albums as interesting as Ms. Amos' sell mainly to the group's relatives, close friends and few others, critical accolade sometimes being like the kiss of death for potential sales. And then there are a handful of artists who have become so well-established commercially that they have the luxury of putting out good music with the reasonable expectation that it will sell, despite a relatively uncommercial sound. Probably the best example of that is Gordon Michael Sumner, better known as Sting, whose new release is entitled Mercury Falling. The bassist and vocalist who got his nickname from a black and yellow jacket he wore that resembled a bee's colors, was the front man for one of the world's most popular bands during the early 1980s, the Police. Since the trio broke up, Sting, who did most of the writing for the band, has been putting out a series of infrequent, but much-anticipated solo recordings that immediately appealed to his former group's huge fan base, but quickly moved beyond the Police's sound. While there was a degree of jazziness in the Police's style, Sting let that influence grow in his music, enlisting first-rate jazz musicians, who returned his phone calls, again based on his success with the Police. To his credit, Sting didn't allow commercial considerations to color his music much, with each of his four previous solo albums marking a further step forward, or in the case of The Soul Cages a phase in his career and life. His music is marked by sophistication in both musical and lyrical facets -- creative compositions with jazzy harmonies and frequent use of unusual time-signatures, and lyrics than ran from allegorical hints at autobiography to social commentary. His last album from three years ago, Ten Summoners Tales, moved a bit more in a rocky direction in terms of instrumentation -- with more of an emphasis on guitars, and fewer contributions by straight-ahead jazz musicians. But Mercury Falling moves back a bit toward the jazzier side, with the return of pianist Kenny Kirkland, who was absent from Ten Summoners Tales, and cameo appearances by saxophonist Branford Marsalis, who was also a part of Sting's earlier solo records. The new album continues Sting's penchant for musical eclecticism, incorporating some of the other non-rock influences he has drawn on in the past, including Celtic and latin sounds. Also this time he brings in the Memphis horns for a little R&B flavor that works surprisingly well. And to throw a curve, he ventures into country, albeit a bit clumsily. His earlier solo albums had a revolving cast of players, but on Ten Summoner's Tales he settled into having a regular band throughout the record, with some added guest musicians. Sting continues that modus operandi on Mercury Falling with a blue-chip four-piece ensemble that includes keyboard man Kirkland, guitarist Dominic Miller, who has been with Sting for the better part of a decade, drummer Vinnie Colaiuta, who is another holdover from Ten Summoner's Tales, and Sting himself who plays both electric and acoustic bass in a very tasteful and understated style. Also continuing on the team was co-producer and engineer Hugh Padgham, whose association with Sting goes back to the Police days. Padgham's work is also a class act. 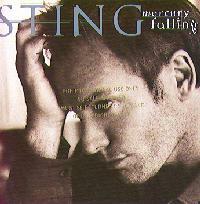 Some critics have faulted Sting for his tendency toward lyrical angst or pretense. But I think this album is probably his best yet, in terms of being literate, poetic and avoiding preachiness or affectation. Each of his more recent releases has had a loose lyrical theme -- especially The Soul Cages with its nautical images and references the reconciling with his father. His last album was mainly a collection of love songs from different perspectives. I suppose Mercury Falling could be considered his "winter album," with frequent references to the cold season. The album's title refers to declining readings on a thermometer and as a phrase turns up in both its first and last songs. Further this album shies away from the autobiographical direction of his earlier work. Musically, Sting again comes up with fine, sophisticated compositions, with his trademark forays into unconventional five and seven-beat meters, and interesting chord changes, even on what seem like outwardly like simple pop tunes. As he has in the past, Sting does not go completely eclectic, but includes enough material with potential commercial appeal that he will not lose his wide audience, while at the same time drawing those who might like his pop songs into his more creative musical realm. When he does go for the more pop side, he manages to do it without much compromise. The result is the finest Sting album since The Soul Cages. Sting's new album Mercury Falling is only his fifth release (not counting a greatest hits set) in the nearly decade since the breakup of the Police, and his first in almost exactly three years. It turns out to be worth the wait. It's a fine record which continues the artist's blend of excellent writing with outstanding musicianship that draws on a healthily eclectic pallet of styles. The fact that Sting can make music this good and with the reasonable expectation that it will go platinum in sales, does make a statement that there is hope for quality in the pop music world. Though Sting doesn't break a lot of musical ground, with the exception of his unsuccessful foray into country, he continues to grow and develop as a fine composer. As a singer, Sting refinement increases, especially when compared to what he sounded like with the Police. His reunion with the jazz musicians, especially pianist Kenny Kirkland, on the new album also adds much. I would rank Mercury Falling among his two best releases. Sonically, the album is a treat. Almost everything is well recorded and mixed without gimmicks. The exceptions are a couple of tracks with the annoying 1990s pop processed drum sound, but even within those selections, the rest of the sonic treatment is clean and audiophile-friendly. If Sting were not a superstar, an album like Mercury Falling would languish in obscurity. Fortunately, this fine blend of musical sophistication and pop sensibility is likely to do well, and it not only makes for good listening, the pop music world will be richer for it.